InfoTrends’ research has found that many consumers are already using AR applications, even if they don’t understand they’re engaging with them. Users must be informed about AR before it can be assumed that they will be on the hunt for new AR experiences. Many users will become frustrated if they need to download a multitude of apps to view every AR-enhanced product. As businesses seek ways to remain competitive in today’s increasingly digital landscape, many are considering the use of content that is enhanced with augmented reality (AR). AR complements printed materials in a variety of ways, making it possible to add more material per page while also enabling additional interactivity. As a software tool, it can enable print service providers (PSPs) and their clients to better track exactly how users are interacting with their content, including who is viewing which AR display and for how long. Like any new technology, though, AR brings with it a unique set of hurdles that must be overcome before the maximum ROI can be achieved. When it comes to AR-enhanced printed products, many of the challenges start with awareness. Modern technology has been accelerating at a dizzying pace, so many people are currently using software and hardware products without fully understanding what they are or how they work. The same is true with AR. According to research from Keypoint Intelligence – InfoTrends, many of today’s consumers use AR applications without realizing that they are even engaging with the technology. For example, photo filters—common on apps like Facebook and Snapchat—are rudimentary AR applications. They overlay digital content over real-world images. Millions of people around the world make use of this technology, but not all of them realize it is AR software. Although the concept of AR has certainly become more mainstream, print providers cannot assume that everyone is familiar with it. Today’s consumers need to be educated about AR, specifically in the areas of how it works and even when it exists. AR is much less accessible to the average consumer than a paperback novel, for example. When people see a book, they expect to see words on its inside pages and they do not need to open the book to know that the content is there. People understand that books fill a function and they know how to use them, but many consumers still don’t know what to expect with AR applications. PSPs that are hoping to take advantage of AR must first create an effective call to action that informs the user of its existence. This can be something as basic as a logo or sentence of written text. The most important part of any call to action is clarity—people need to be informed of AR’s functionality, and this responsibility falls on service providers. Today’s PSPs must clearly and concisely communicate the presence of AR functionality and explain how it is meant to be used. Zappar, an organization that creates AR toolkits, advocates a two-pronged approach when it comes to user education. Many products that are made with the company’s technology include visual as well as written directions, showcasing the path to AR creation in three easy steps. 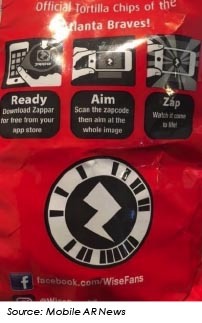 Every AR-enhanced product is also marked with a Zappar logo. In the future, the company hopes that the presence of its logo will be enough to inform consumers of AR’s presence, but this will never happen if consumers are not properly educated. For the time being, users must be informed about the presence of AR and how it is meant to be interacted with before it can be assumed that they will be on the hunt for new AR experiences. At this time, the AR solution market is quite large. Although this is certainly a positive for innovation, it can be a detriment to user-friendliness, particularly if certain AR apps are not compatible with others. All PSPs will of course want consumers to view their content, but the average user may get frustrated if he or she is required to download a multitude of apps to view every AR-enhanced product. If the process is not streamlined, some consumers will be inclined to simply abandon the idea of interacting with AR. First and foremost, enterprises want their solutions to be accessible. This means working to deliver a common framework—one that enables AR viewing while minimizing the work that is expected of consumers. Although a ubiquitous AR solution is unlikely, it is important to act now to reduce the number of applications. Some PSPs might balk at the idea of using the same technology as their competitors, but a solution will be markedly more accessible if a consumer can access many types of content with a single solution. This will improve the overall AR experience and also increase the likelihood that consumers will choose to interact with it again in the future. AR technology is still relatively new, so now is a great time to ensure that solutions are flexible, intuitive, and appealing to a wide range of customers. This will help more users understand and interact with the technology as is continues to change and improve over time. Can an AR Headset Work? Although smartphones are widespread and versatile, this versatility can become a detriment for AR—since smartphones are intended to be used for a wide variety of tasks, most users are not aware of their device’s full potential. With a dedicated device like an AR headset, users immediately understand that they are about to view something that is digitally enhanced. The issue here is that no AR headset has achieved mainstream success. Even attempts from industry giants (e.g., Google Glass) have met with an icy reception, so most of these devices are only used in niche workplace settings. Until an AR headset encounters widespread acceptance in the consumer space, enterprises are better off with AR solutions that are designed for mobile hardware. AR is a natural extension to print—It can enhance the tactile experience of handling a physical document while also enabling a tried-and-true communication piece to remain innovative and relevant. Even so, not every business that experiments with AR will be successful. Effectively implementing an AR solution requires foresight and careful testing. At this stage, usability must be the paramount priority. Today’s consumers need to be educated about the existence of AR, and the technology must be accessible to the masses without steep learning curve. Businesses should carefully research third-party solutions before committing to a platform. Those that opt to rely on an in-house development should take the necessary steps to ensure that the solution is approachable. Minimizing the difficulty of download will help increase user satisfaction and improve the likelihood that more consumers will interact with AR technology in the future. Colin McMahon is a Research Analyst at Keypoint Intelligence – InfoTrends. He primarily supports the Business Development Strategies and Customer Communications services. In this role, he creates and refines much of InfoTrends’ written content, including forecasts, industry analysis, and research/multi-client studies. He also assists with the editing and formatting processes for many types of deliverables. Interesting how this topic keeps popping up. Almost 10 years ago, I was introduced to AR and during my time with a leading financial institution, I studied how we could use AR along with transpromo print. I proposed that we could reduce customer service calls by using AR to help explain billing statements. I also found that AR could be used to provide shopping information such as sales and promotions. AR could be used to show merchant locations, maps and directions. I easily developed an AR application that included information for products promoted on the printed onserts such as instructions for installing home thermostats. The best part was, it was a very easy process. I am not a coder/developer so as they say, if I can do it anyone can do it! Odd that using AR as a sales tool for PSPs is not addressed in this (good) article. I see greater value in using AR to sell products like standees, roll up banners and signage. AR can effectively demonstrate what different things look like in place at a trade show, retail environment or an event venue. This is something that PSP salespeople could adopt easily with mobile apps. BeholdAR and similar apps provide an easy way to show how different styles of standees, fabric displays, and signage solutions will look in the actual environment. Selling AR by PSP’s? New skill set and really a different business. More the stuff for a digital marketing agency to prove up the value and effectiveness of using AR in a campaign. Most PSPs do not have the skills, resources or the relationship with the client to achieve this. More power to them if they do! Marketing is further upstream than printing in the decision-making process.